Vivo has launched the Vivo Y81i in India. This phone is a small variant of Vivo Y81. The company has quietly introduced this smartphone in the offline market. The device costs 8,490 rupees. In the Vivo Y81i, MediaTek’s Helio A22 SoC has been given just like the Redmi 6A. In addition, the smartphone has 2 GB RAM and 16 GB storage. 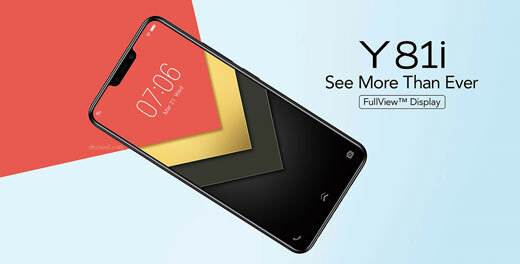 Earlier, the company had launched Y81 with 3GB RAM at Rs. 12,999. Recently, the price of this device was cut by Rs. 1,000. After the price cut, the device is being sold in the Indian market for Rs 11,990. Vivo Y81i comes with 6.2 inch HD plus noutch display. This smartphone is powered by 1.8GHz octo-core MediaTek MT6761 Helio A22 processor which comes with 2GB high speed RAM and 16GB internal storage memory. This smartphone runs on Android 8.1 oreo operating system with 3260mAh non removable battery. If we talk about the camera, this smartphone comes with 13 MP rear camera and 5MP front shooter camera for taking selfies with 2x optical zoom. The Vivo Y81i dual sim smartphone comes with 3G, 4G with Wi-Fi, PS, Bluetooth, USB OTG feature. You can also get rear fingerprint sensor, compass, magnetometer, proximity, accelerometer, hall, ambient light sensor and gyroscope feature. This smartphone supports Volte/4G/3G/2G on compatible networks. Processor Quad-core MediaTek MT6761 Helio A22, 2.0GHz. PowerVR GE8320 graphics. Memory 2GB RAM with 16GB internal storage. Display 6.2 inches IPS LCD display, 19:9 ratio. Battery 3260mAh. 5V / 2A charging. Price & Color 8490/- Rs. I hope you like Vivo Y81i. This means that before the end of the year the company can offer gifts to its users by offering two smartphones in the market. Please use comment box and share your view on Vivo Y81i. Thanks to all.